BitConnect is a scam. But you can ask yourself: is it possible that in the 21st century such a large-scale scenario of deception is realized in front of millions of people? As practice has shown, this is more than possible. The story with BitConnect is a vivid proof of this. Where there are people who intend to steal from someone, there are those who easily part with their money, believing in the colossal profit without any effort. All this is relevant for the rapidly growing market of crypto-currencies, whose capitalization has grown almost 20-fold in just one year. Crypto-currencies are created to make everyone "financially independent", so everyone has the right to decide how much they are willing to risk and how much they are willing to lose. Lightning-fast BitConnect’s hitting the Top-10 list of Coinmarketcap with a capitalization of $ 2 billion shortly after the launch of the project in 2016 stunned many of us, and rumors of a questionable scheme began to spread rather quickly. However, only by the end of 2017, prominent representatives of the crypto-currency industry decided to publicly blame the project for organizing an investment fraud, the so-called Ponzi scheme. The fact that the developers and founders of the project concealed their identity, became the reason for the first suspicion of ordinary users, despite the fact that the anonymity in the world of crypto-currency is the cornerstone of the industry. Do you need other bitconnect scam proof now? Can a bitconnect scam be explained in a few words? Of course, if we trace the history of this platform. The BitConnect cryptocurrency platform unexpectedly announced the closure of the exchange and the lending program. According to Bloomberg, the company ceased this activity due to the requirements of the state regulators of Texas and North Carolina, who charged the distribution of unregistered securities under the guise of tokens: BitConnect is not registered for the sale of securities in these states, but offers customers to receive interest through investment and credit. BitConnect has notified users on its website that it will continue to provide services as a wallet and will change the format to the media platform. This announcement was a surprise for thousands of investors who trusted their funds to the company that provides deposits and loans in the cryptocurrency, as well as services for mining. BitConnect entered the market through ICO in late December 2016, and its BCC tokens proved to be one of the fastest growing cryptocurrencies in 2017. According to the data of CoinMarketCap, the capitalization of BCC in a relatively short time reached a mark of $ 2.6 billion, and the rate for ATH was $ 460. Despite the rapid growth and growing user base, rumors about a dubious business model that resembled a pyramid, or the so-called Ponzi scheme, began circulating around the platform. The platform guaranteed 40% return for investors during the month, offering a four-level investment system based on the amount of the initial deposit: the more money you initially invest, the more profits you can get. Regardless of the amount of the deposit, investors were promised a daily return on investment (ROI) of 1%. To this end, the company developed its own trading bots, which were supposed to turn the investments of customers into a whole state. Thus, the replenishment of the investment account of BitConnect at $1,000 had to bring more than $50 million in revenue over three years, assuming that the scheme does indeed meet the promise of a 1% daily revenue. Despite these warnings, BitConnect continued to gain momentum. The company relied on an aggressive marketing strategy with an army of affiliated marketers who earned by attracting even more new investors - and so on, and so on. In general, this is the classical financial pyramid. It's amazing how such a classic scheme was able to collect such a large investment. After all, this is much more serious than the same romancecompass scam, that is also a popular request in Google. Fraudulent schemes in the cryptocurrency world will soon squeeze out their "brethren" - fraudulent schemes in the world of dating business. Whatever you do, it's worth reading independent reviews about the project in which you are going to participate. A profit from reading romancecompass reviews or a cryptocurrency platform review is obvious. 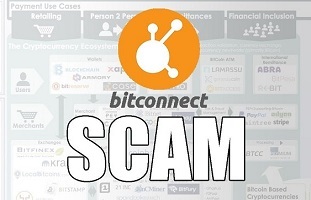 So is bitconnect a scam? Yes, it is. Absolutely. A financial pyramid is a way of getting its participants profit by constantly attracting new financial resources. The creators of the pyramids register them as commercial enterprises, whose activities are aimed at obtaining funds for the development of a project. If the business plan fails, then the members of the organization attract new members to pay the income. Throughout the life of the financial pyramid, the promised income is only managed by those who joined the organization at the initial stage of the project. After the funds cease to be enough to pay dividends to all other members of the community, the enterprise declares itself bankrupt. Organizers prefer to hide from justice and their former comrades-in-arms. The first financial pyramid was created in the US in the early 20th century. Its organizer was the enterprising Charles Ponzi. After moving from Europe to America, he tried to get rich. After several unsuccessful attempts, Charles accidentally came up with the idea of trying to profit from the difference in the exchange rates of different countries. Pyramids are like an influenza virus that evolves, acquiring immunity against antibiotics, against those drugs that treat it. The situation with Ponzi is the same. From the primitive financial pyramids of the 1990s, they evolve into complex structures, such as BitConnect. Among the signs of the financial pyramid, there is the implementation of non-licensed types of activities. As a rule, such organizations do not have licenses to raise funds, they work outside the regulatory legal field. The next sign is high yield, which significantly exceeds market interest rates. Further - this is a guarantee of profitability. In principle, the only tool that assumes the guarantee of profitability is bank deposits or other securities, such as bonds. There are also internal signs of the financial pyramid, which are not visible to ordinary people - this is the payment of funds to the participants of the pyramid solely at the expense of attracting the money of new participants. Also, such companies usually do not have their own funds, since the founders of the financial pyramid do not invest in the business. And it's not very clear what they are doing. And any legal business has a business model. Remember it once and for all. Be vigilant and take care of yourself and your money! Better invest extra money in your own business.